In Windows Azure platform there are 3 storage we can use to save our data on the cloud. They are the Table, Blob and Queue. Before the Chinese New Year Microsoft announced that Azure SDK 1.1 had been released and it supports a new type of storage – Drive, which allows us to operate NTFS files on the cloud. I will cover it in the coming few posts but now I would like to talk a bit about the Table Storage. The most common development scenario is to retrieve, create, update and remove data from the data storage. In the normal way we communicate with database. When we attempt to move our application over to the cloud the most common requirement should be have a storage service. Windows Azure provides a in-build service that allow us to storage the structured data, which is called Windows Azure Table Storage Service. The data stored in the table service are like the collection of entities. And the entities are similar to rows or records in the tradtional database. An entity should had a partition key, a row key, a timestamp and set of properties. You can treat the partition key as a group name, the row key as a primary key and the timestamp as the identifer for solving the concurrency problem. Different with a table in a database, the table service does not enforce the schema for tables, which means you can have 2 entities in the same table with different property sets. The partition key is being used for the load balance of the Azure OS and the group entity transaction. As you know in the cloud you will never know which machine is hosting your application and your data. It could be moving based on the transaction weight and the number of the requests. If the Azure OS found that there are many requests connect to your Book entities with the partition key equals “Novel” it will move them to another idle machine to increase the performance. So when choosing the partition key for your entities you need to make sure they indecate the category or gourp information so that the Azure OS can perform the load balance as you wish. Although the table service looks like a database, you cannot access it through the way you are using now, neither ADO.NET nor ODBC. The table service exposed itself by ADO.NET Data Service protocol, which allows you can consume it through the RESTful style by Http requests. The Azure SDK provides a sets of classes for us to connect it. There are 2 classes we might need: TableServiceContext and TableServiceEntity. CreateQuery: It will create a IQueryable instance from a given type of entity. AddObject: Add the specified entity into Table Service. 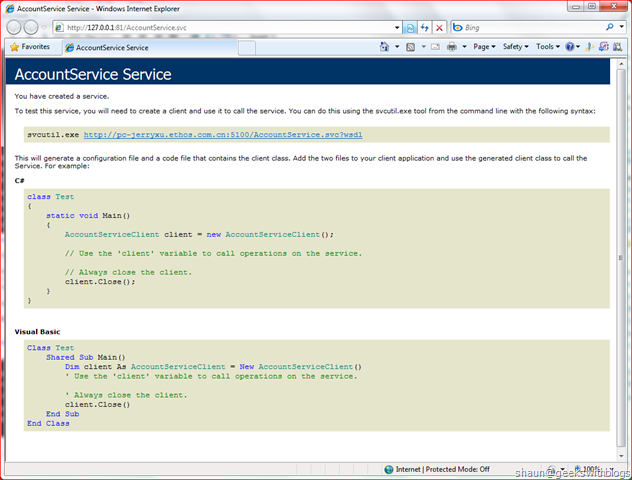 UpdateObject: Update an existing entity in the Table Service. DeleteObject: Delete an entity from the Table Service. Beofre you operate the table service you need to provide the valid account information. 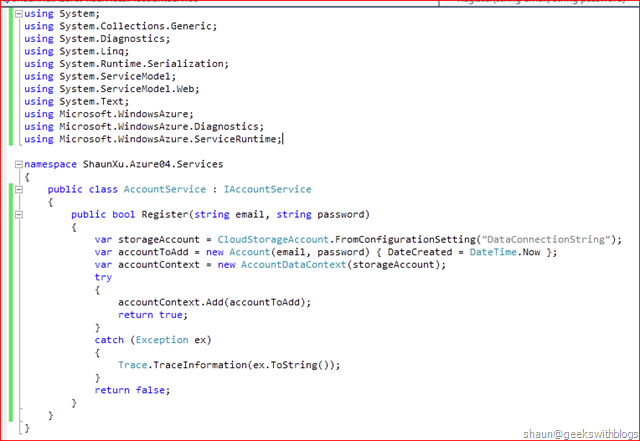 It’s something like the connect string of the database but with your account name and the account key when you created the storage service on the Windows Azure Development Portal. After getting the CloudStorageAccount you can create the CloudTableClient instance which provides a set of methods for using the table service. A very useful method would be CreateTableIfNotExist. It will create the table container for you if it’s not exsited. And then you can operate the eneities to that table through the methods I mentioned above. Let me explain a bit more through an exmaple. We always like code rather than sentence. The solution should be like this below. Then I added a configuration items for the storage account through the Settings section under the cloud project. 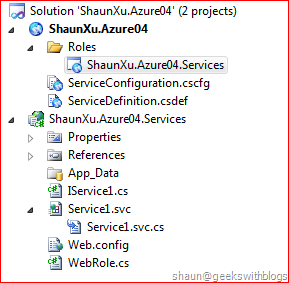 (Double click the Services file under Roles folder and navigate to the Setting section.) This setting will be used when to retrieve my storage account information. Since for now I just in the development phase I will select “UseDevelopmentStorage=true”. And then I navigated to the WebRole.cs file under my WCF project. If you have read my previous posts you would know that this file defines the process when the application start, and terminate on the cloud. What I need to do is to when the application start, set the configuration publisher to load my config file with the config name I specified. So the code would be like below. I removed the original service and contract created by the VS template and add my IAccountService contract and its implementation class - AccountService. And I add the service method Register with the parameters: email, password and it will return a boolean value to indicates the result which is very simple. At this moment if I press F5 the application will be established on my local development fabric and I can see my service runs well through the browser. Let’s implement the service method Rigister, add a new entity to the table service. As I said before the entities you want to store in the table service must have 3 properties: partition key, row key and timespan. You can create a class with these 3 properties. The Azure SDK provides us a base class for that named TableServiceEntity in Microsoft.WindowsAzure.StorageClient namespace. So what we need to do is more simply, create a class named Account and let it derived from the TableServiceEntity. And I need to add my own properties: Email, Password, DateCreated and DateDeleted. The DateDeleted is a nullable date time value to indecate whether this entity had been deleted and when. Do you notice that I missed something here? Yes it’s the partition key and row key I didn’t assigned. The TableServiceEntity base class defined 2 constructors one was a parameter-less constructor which will be used to fill values into the properties from the table service when retrieving data. The other was one with 2 parameters: partition key and row key. As I said below the partition key may affect the load balance and the row key must be unique so here I would like to use the email as the parition key and the email plus a Guid as the row key. OK now we finished the entity class we need to store onto the table service. The next step is to create a data access class for us to add it. 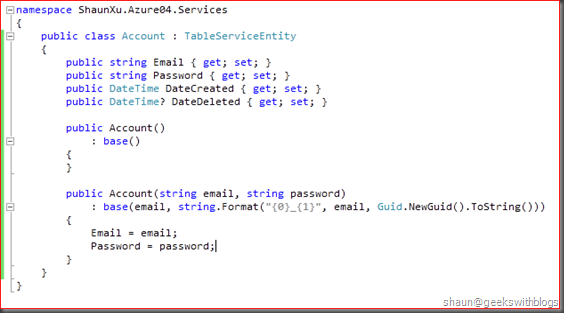 Azure SDK gives us a base class for it named TableServiceContext as I mentioned below. So let’s create a class for operate the Account entities. The TableServiceContext need the storage account information for its constructor. It’s the combination of the storage service URI that we will create on Windows Azure platform, and the relevant account name and key. The TableServiceContext will use this information to find the related address and verify the account to operate the storage entities. Hence in my AccountDataContext class I need to override this constructor and pass the storage account into it. All entities will be saved in the table storage with one or many tables which we call them “table containers”. Before we operate an entity we need to make sure that the table container had been created on the storage. There’s a method we can use for that: CloudTableClient.CreateTableIfNotExist. So in the constructor I will perform it firstly to make sure all method will be invoked after the table had been created. Notice that I passed the storage account enpoint URI and the credentials to specify where my storage is located and who am I. Another advise is that, make your entity class name as the same as the table name when create the table. It will increase the performance when you operate it over the cloud especially querying. Since the Register WCF method will add a new account into the table service, here I will create a relevant method to add the account entity. Before implement, I should add a reference - System.Data.Services.Client to the project. This reference provides some common method within the ADO.NET Data Service which can be used in the Windows Azure Table Service. I will use its AddObject method to create my account entity. Since the table service are not fully implemented the ADO.NET Data Service, there are some methods in the System.Data.Services.Client that TableServiceContext doesn’t support, such as AddLinks, etc. 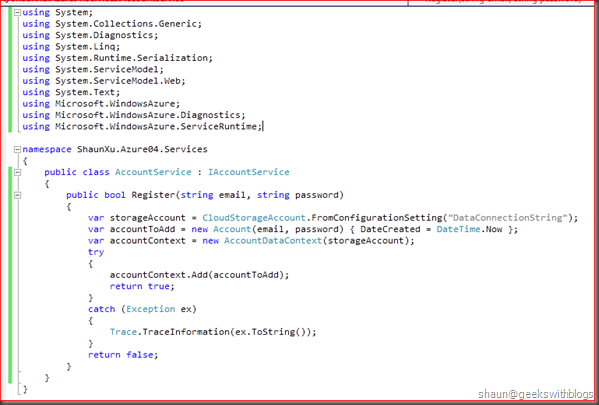 Then I implemented the serivce method to add the account entity through the AccountDataContext. 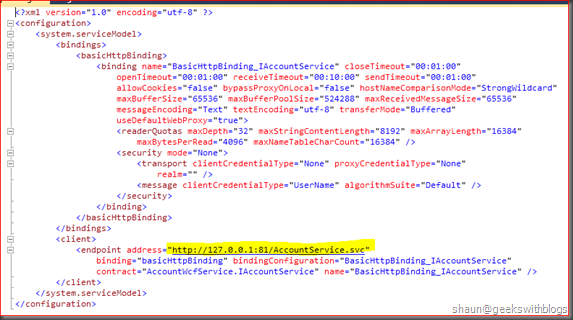 You can see in the service implmentation I load the storage account information through my configuration file and created the account table entity from the parameters. Then I created the AccountDataContext. If it’s my first time to invoke this method the constructor of the AccountDataContext will create a table container for me. 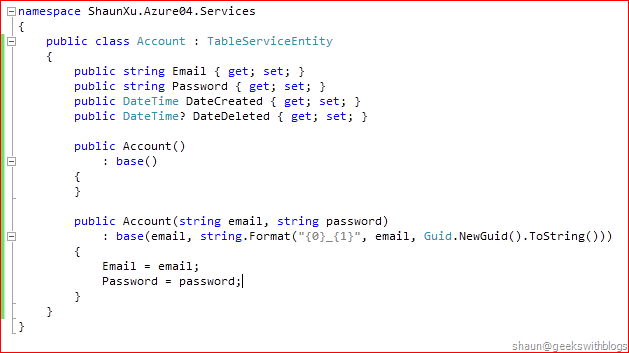 Then I use Add method to add the account entity into the table. 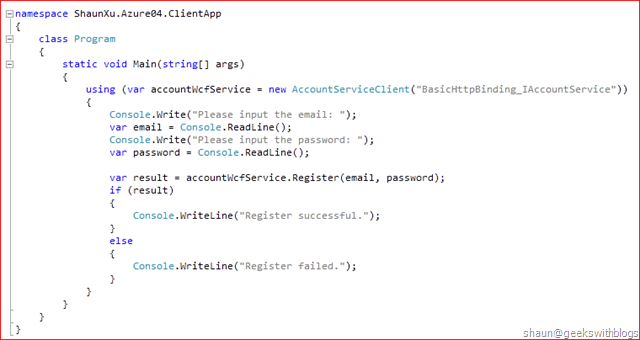 Next, let’s create a farely simple client application to test this service. 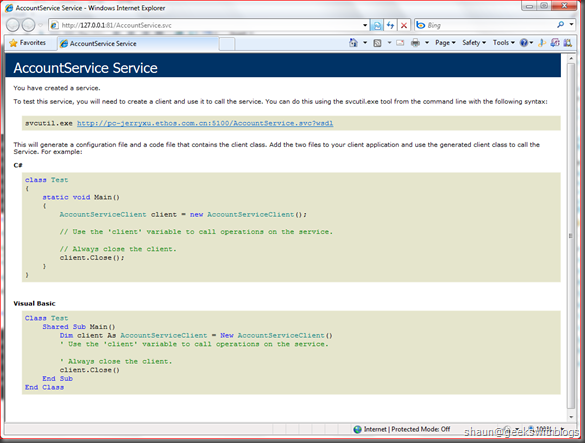 I created a windows console application and added a service reference to my WCF service. 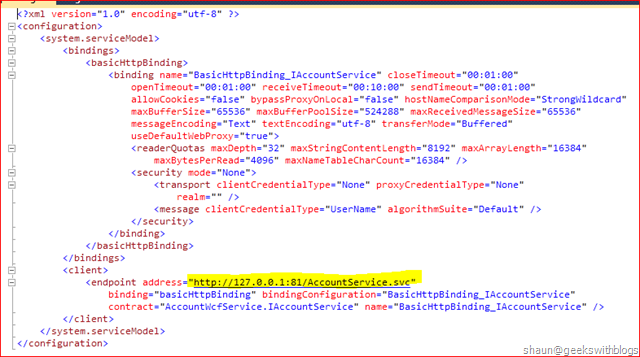 The metadata information of the WCF service cannot be retrieved if it’s deployed on the Windows Azure even though the <serviceMetadata httpGetEnabled="true"/> had been set. If we need to get its metadata we can deploy it on the local development service and then changed the endpoint to the address which is on the cloud. In the client side app.config file I specified the endpoint to the local development fabric address. 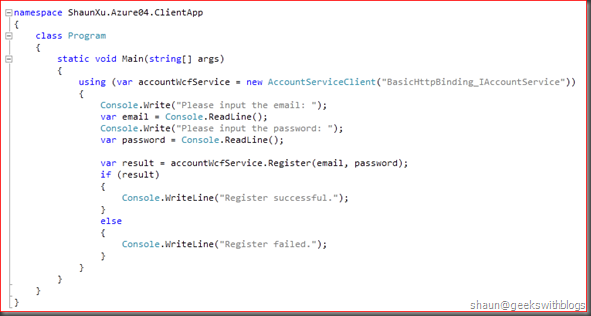 And the just implement the client to let me input an email and a password then invoke the WCF service to add my acocunt. Let’s run my application and see the result. Of course it should return TRUE to me. And in the local SQL Express I can see the data had been saved in the table. 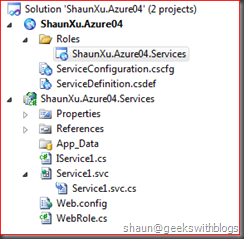 In this post I explained more about the Windows Azure Table Storage Service. I also created a small application for demostration of how to connect and consume it through the ADO.NET Data Service Managed Library provided within the Azure SDK. I only show how to create an eneity in the storage service. In the next post I would like to explain about how to query the entities with conditions thruogh LINQ. I also would like to refactor my AccountDataContext class to make it dyamic for any kinds of entities. Thanks and will post more article. Your article are really awesome. Actually I was in search for some good articles on DML and DQL using Table Service in Windows Azure and finally I got one.